There seems to be a consensus, at least amongst the general population who don’t actively seek out films of the animated kind (myself included, until recently), that animated films are predominantly ‘kids’ films. Or, perhaps, films that are majorly made for children but can appeal to adults on a larger scale; Pixar films often seem to strike this chord, as do Studio Ghibli. Yet, there’s little in the realm of animated films that are made specifically for a more mature audience, that deal with solely ‘adult’ themes. And when there is, they tend to be, for the most part, underrated. 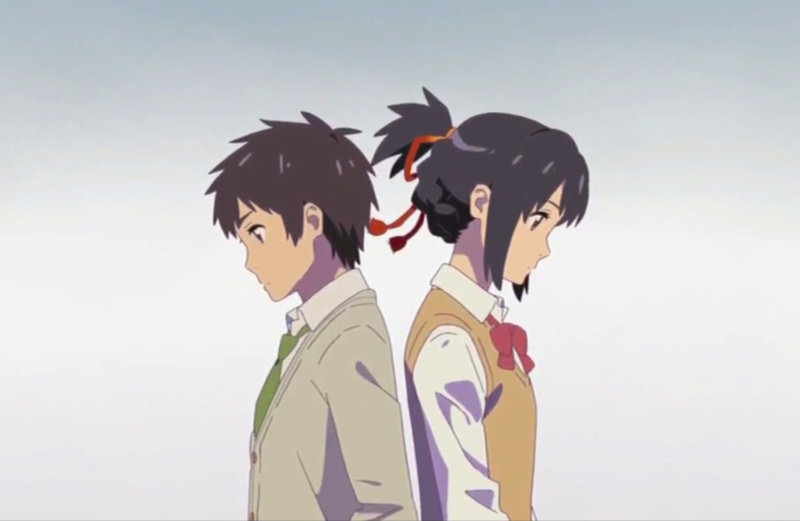 I don’t mean underrated in the typical sense, the film of this focus, Your Name, did pretty exceptionally by critical standards. It boasts a 97% fresh rating on Rotten Tomatoes and has become the highest-grossing anime film ever. What I’m referring to here is a film that flies outside the Pixar-Ghibli-Disney sphere and as a result was criminally condemned to an extremely limited western release, and so on a wider scale has been missed by large audiences. Which brings me to Your Name. It’s a film I stumbled across because it was on the 99 cent rentals list on itunes, and I waited until the last day of my 28 rental period to watch it, and now, I wish I’d watched it earlier so I had more time to actually enjoy it. It left me an emotional wreck, with my breath knocked away and it lingering in my mind for days. Diluted down to its basics, it’s an Interstellar-esque romantic drama with Freaky Friday quirks. On a deeper note, it is probably one of the most hard-hitting films I’ve watched in 2018. Stunning animation, glorious voice-acting (for the love of god, stay away from the english dub, it’s like comparing a warbling two year old to La Bohéme) and precise direction from Makoto Shinkai combine to create an unforgettable film about love, loss and destiny. It balances the ideas of fate and forging your own destiny on a razor blade, and manages to maintain this throughout the whole story and never once gives in to one over the other, creating an equally suspenseful and emotional narrative. With focused, controlled and beautifully coordinated art direction by Masashi Ando, the division between Tokyo and the fictional rural town of Itomori is at first stark and potentially jarring, but the beauty in them is something that becomes apparent. The cold blues of Tokyo and the lush greens of Itomori clash, but as the story progresses so too does its design, almost a third character progressing and growing with Taki (Ryunosuke Kamiki) and Mitshua (Mone Kamishiraishi). A time-traveling, body-swapping adventure, it does all this while being darkly comic and providing an intense contemporary insight into both romantic and platonic relationships.